The Jee Advanced 2017 has come and gone but not without leaving a trail of events that are unique to the JEE Advanced. 1.7 lakhs of students appeared out of the 2.2 lakhs who qualified for the JEE Advanced 2017 in their fight for seats in the prestigious IITs. JEE Advanced is the only qualifying exam for the IITs. Let’s take a trip down memory lane and see for ourselves what these IIT aspirants and JEE Advanced examinees faced on the fateful May 21, 2017. The JEE Advanced Paper 1 covered multiple choice questions, integer type questions, as well as the newly introduced three-column matrix match. Overall, Paper 1 of JEE Advanced 2017 was designed with a good mixture of conceptual and tricky questions. The JEE Advanced 2017 Paper 1 carried a total of 183 marks. The booklet had 36 printed pages and 54 questions in total. Duration of the exam was 3 hours. JEE Advanced Paper 1 has 3 parts – Physics, Chemistry, and Mathematics. Each subject is allotted 61 marks. In each part, there were three sections: Section 1 (Maximum marks – 28), Section 2 (Maximum marks – 15) and Section 3 (Maximum marks – 18). Section 1 of the JEE Advanced 2017 Paper 1 had 7 questions with 4 options in which one or more than one options were correct. Marking scheme in this section is +4 in case all options are correct, +1 for each correct response, 0 marks for no response and -2 for all other cases. Maximum marks for this section was 28. Section 2 had 5 questions with correct response being a single digit integer from 0 to 9, both inclusive. The making scheme was +3 for the correct response and 0 marks in all other cases. Maximum marks for this section was 15. Section 3 had 6 questions of matching type. This section contained two tables (each having 3 columns and 4 rows). Based on each question, there were 4 options in which only one option was correct, with correct response being a single digit integer from 0 to 9, both inclusive. Marking scheme in this section was +3 if the correct option is marked, 0 marks if none of the options is marked and -1 in all other cases. Maximum marks for this section was 18. There were 54 questions and, overall, it was easier in comparison to 2016. Chemistry: This section was difficult in comparison with Mathematics. On a scale of 10 maximum questions were distributed among difficulty levels 6, 7, and 4. Physics: This section was also difficult in comparison with last year. Maximum questions were distributed amongst difficulty levels 5 and 6. Mathematics: This section was the easiest. Maximum questions were of difficulty level 4, 5 and 6. JEE Advanced 2017 students found the overall level of paper moderate level but not easy. Chemistry was reported tougher compared to Math & Physics. Total no. of questions (54 questions) remains the same as last year. However, total marks of Paper 1 has changed from 186 to 183 marks this year. In the JEE Advanced 2017 Paper 2, there were more than one option correct type questions, single option correct type questions, and paragraph type questions with respect to the types of questions. It seemed relatively more difficult than Paper 1. The JEE Advanced 2017 Paper 2 carried a total of 183 marks. JEE Advanced Paper 2 has 3 parts – Physics, Chemistry, and Mathematics. In each part, there were three sections: Section 1 (Maximum marks – 21), Section 2 (Maximum marks – 28) and Section 3 (Maximum marks – 12). Section 1 had 7 questions with 4 options in which only one option was correct. Marking scheme in this section was +3 in case the option was correct, 0 marks for no response, -1 mark for all other cases. Maximum marks for this section was 21. Section 2 had 7 questions with 4 options in which one or more than one options were correct. Marking scheme in this section was +4 in case all options are correct, +1 for each correct response, 0 marks for no response and -2 for all other cases. Maximum marks for this section was 28. Section 3 had 2 paragraphs with 2 questions in each paragraph. Each question had 4 options with only one correct option. Marking scheme in this section is +3 if the correct option is marked, 0 marks in all other cases. Maximum marks for this section was 12. This was difficult in comparison with Paper 1 and almost of the same difficulty as last year’s. Chemistry: Paper 2 surprised students with high difficulty level which was 5.5. 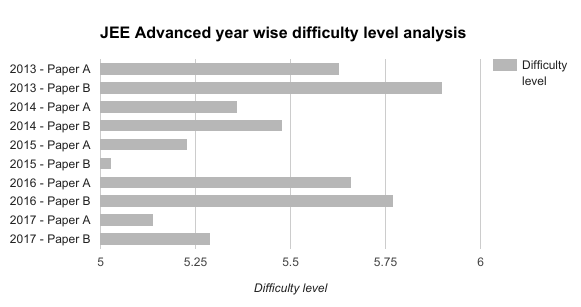 Maximum questions were distributed among difficulty levels 5, 6 and 7. Physics: Paper 2 was of almost same difficulty level as of Paper 1. Mathematics: Paper 2 was difficult in comparison with Paper 1 where maximum questions were distributed among difficulty level 5, 6 and 7 and the trend was almost same as of Chemistry from Paper 1 to 2. 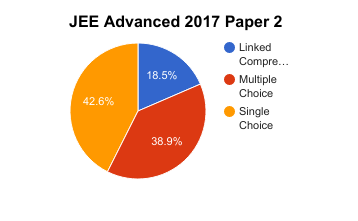 JEE Advanced 2017 students found the overall level of paper moderate level. Physics & Chemistry was reported tougher than Mathematics section. Total no. of questions (54 questions) remains the same as last year. However, total marks of Paper 2 has changed from 186 to 183 marks this year. Let’s now look at the overall analysis of the JEE Advanced 2017. Physics was considered to be moderate in difficult. Compared to last year, though, it was relatively easier. A majority of the questions were conceptual and needed students to be strong with basics. Chemistry was considered to relatively easy in comparison to last year. Questions from this subject were a mix of conceptual and formula-based. Mathematics was moderately difficult. Compared to last year though, it was comparatively easier. A majority of the questions were concept-based, while the rest required the use of facts and formulas. There was a pattern change in the matrix type; instead of 2 columns, there were 3 columns to match this time. Integer type – This type of questions were difficult because a student had to fill the answer from 0 to 9 and so the students could not apply the method of elimination. But there was no negative marking so students could try their luck. Matrix questions – Students who actually solved the problem could score marks in this type of questions. Multiple Choice – This was the toughest section of the paper because of plus 4 and minus 2 marks. In this type of questions, the students were supposed to select more than 1 option from the given which makes this section challenging. The best brains also fell into ambiguity in this section. Linked Comprehension – In this type of section, the students were supposed to read a passage and answer questions based on their analysis. Multiple Choice – This was same as Paper 1, though the questions were tougher than paper 1. Single Choice – This was the easiest section of the paper comprising 42% of it. Most of the students scored high marks in this section. Only one of the given options was correct. Memory – A lot of formula and equations were the prerequisite to solve 50 questions out of 54 questions. Visualisation – Students were required to imagine the situation to solve 47 questions analytically or by calculation and take into consideration the constraints involved in the problem. Analytical – Out of 54 questions, 45 questions needed an analytical skill set to reach the solution. Calculation – It was very surprising that only 32 questions out of 54 required calculation. Deductive – There were 19 questions from this type which required the most exclusive skill set that mostly top rankers could solve. Intuitive – Only students who have practised the questions on similar patterns before could solve these types of questions. There were 7 questions with this skillset. Analytical – Highest number of questions required an analytical skill set that made paper 2 more difficult in comparison with Paper 1. Memory – In Paper 2 fewer number for formulas and equations were required in comparison with Paper 1 so making it overall more difficult as real problem-solving ability was required. Visualisation – There was a fewer number of visualisation based questions. Mostly, analytical skill was required. Intuitive – The number of intuitive questions increased that made the paper more difficult as only those students who have practised questions well were able to figure out right approach in the first attempt and students without this skill were struggling to find the right approach. 28% of the questions were from the chapters Atomic Structure, Chemical Bonding, General Organic Chemistry, Laws of Thermodynamics and Magnetic Effects of Current. We present a detailed concept wise analysis of the paper here. 28% of the questions were from the chapters Hydrocarbons, Electrostatics, General Organic Chemistry, Rotational Motion and P-Block Elements. We present a detailed analysis of the number of questions against the number of concepts involved in those questions. 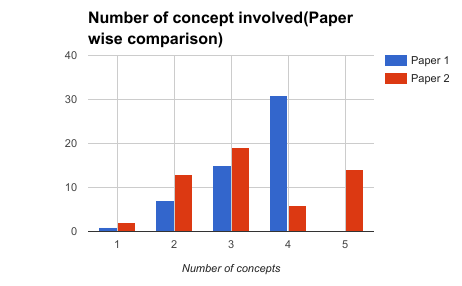 It is easy to infer that the number of concepts involved in Paper 1 was more than the number of concepts involved in Paper 2. 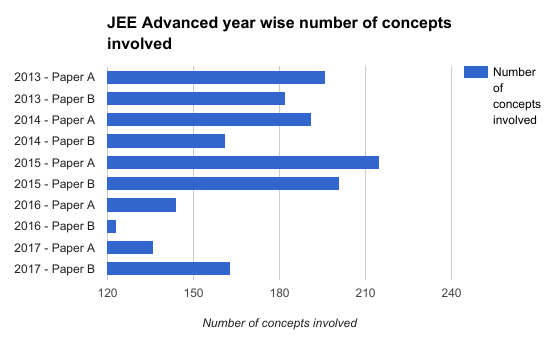 This graph shows that the number of concepts involved in JEE Advanced 2017 paper has increased with respect to 2016 and is less than the number of concepts involved in JEE Advanced 2013, 2014 and 2015. The Indian Institute of Technology (IIT) Madras conducted the Joint Entrance Exam (JEE) Advanced 2017 on Sunday in which about 2 lakh candidates appeared. The boards with a major share in this number are the boards of Uttar Pradesh, Maharashtra, Rajasthan, Andhra Pradesh, and Telangana among others. “In comparison to the practice of previous years, the Mathematics question required only basic understanding. Matrix match involving 3 Column was introduced, but if the student had got the hang of it, he/she would have found it easy to crack,” says our faculty expert. The JEE Advanced 2017 results will be announced on June 18, 2017. The ORS will be graded and scrutinised with extreme care. The ORS of all candidates who have appeared for both Paper 1 and Paper 2 will be displayed on the online portal, www.jeeadv.ac.in, along with the machine-read responses. In the case of perceived discrepancy, candidates can seek review of the machine-read responses. The requests should be submitted online. In addition, candidates should pay review fee at the rate of INR 500 per question to be reviewed. Detailed instructions and the mode of payment will be provided on the online portal. The JEE Advanced 2017 Answer Key for both Paper 1 and Paper 2 will be displayed on the online portal, www.jeeadv.ac.in. Before the release of the official Answer Key, private educational institutes may also release their answer keys of the JEE Advanced. As you await the JEE Advanced 2017 results, we wish you all the best. 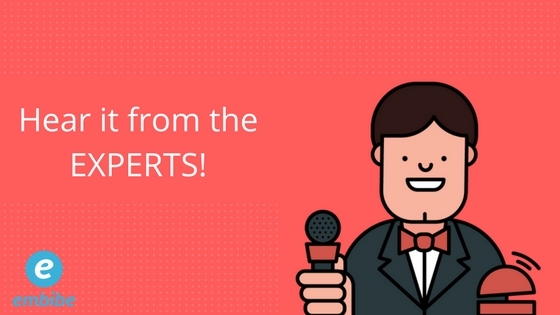 Stay tuned to Embibe for updates on IIT counselling!